Backed by rich experience in the industry, we are engaged in manufacturing, exporting and supplying a superior quality assortment of Pencil Box, Chemical Bottles, Plastic Bottles & Jars. Our offered range includes Office Paste Gum Bottle, Computer Cartridge Bottle, Toilet Cleaner Bottle, Plastic Lubricant Oil Bottle, Plastic oil Bottle, House Hold Jars, Machine Oil Bottle, etc. All these bottles are designed at our high end manufacturing unit using supreme class virgin plastics and latest manufacturing techniques in compliance with set industry norms. Appreciated for perfect finish, light weight, attractive colors, high strength and durability, these plastic bottles are widely demanded in various cosmetic, food & beverages, cosmetic, pesticides companies, etc. Our highly qualified and skilled team of professionals enables us in manufacturing this range of bottles in various specifications to fulfill the wide demands of the clients. Since our commencement, we have been consistently maintaining our quality in order to maximize client satisfaction. 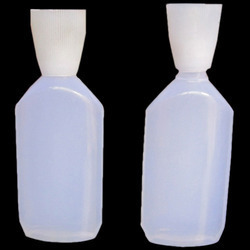 We offer these attractive bottles to our precious clients in easy modes of payment that too within promised time frame. Due to our client-centric policies, transparent dealings and competitive price structure, we have garnered huge client base all across the globe.